A number of randomised controlled trials – the gold standard scientific method for testing whether a treatment works – show various parent-training and therapist-delivered interventions can help young children with autism to build skills for social communication and independent living. In most of the Western world, autism is diagnosed between the ages of two and five when behavioural symptoms have become clear. But could waiting until early childhood mean we’re missing a valuable opportunity for early intervention? We know that the earlier an intervention begins, the greater the chance we have for positive outcomes. This is because the brains of young children are developing rapidly and can adapt to new learning experiences. As a result, several research groups around the world have started exploring very early intervention for infants who are at high risk of developing autism. These include infants who show early signs of autism and the infant siblings of children with a diagnosis, who have about a 20% chance of also developing autism (compared to the general population risk of around 1%). Late in 2014, a US-based team reported that a parent-training intervention seemed to improve behaviours related to autism in a small group of infants. The researchers enrolled children who were showing early signs of autism – reduced motivation and skills for interacting with others – and followed them until they were three years old, which is when autism can be confidently diagnosed or ruled out. While almost all children in this study showed good outcomes, the sample size was very small (seven children completed the therapy). Another limitation was that the researchers did not randomly allocate infants to the therapy group, so we can’t be sure the observed benefits were due to participating in the therapy. Nonetheless, the project was a good proof-of-concept study, a first stab at showing that very early intervention for infants at risk of autism might be worthwhile. Early in 2015, a UK-based research team reported on another very early intervention; this time tested among “high-risk” infant siblings. This study used the most rigorous scientific design, randomly allocating 54 parents and their infants to trial the new intervention or to continue without any specific therapy. So far, these infants have only been followed to 14 months of age, which is not old enough to know whether any have developed autism. But because the researchers took several different measures of autism “risk”, the early trial results look promising. 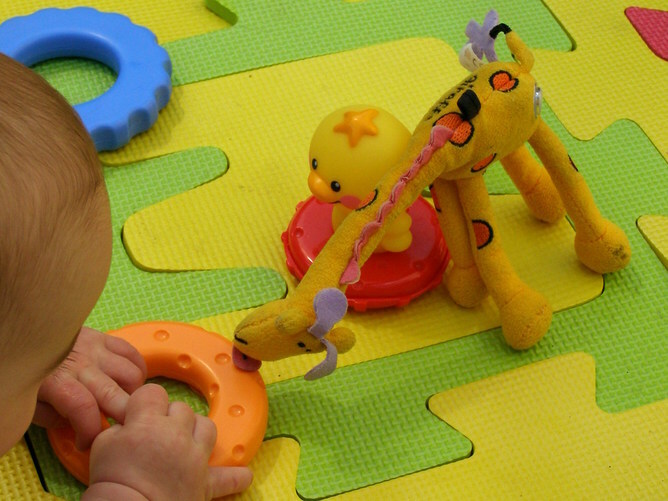 The group of infants who received the new therapy tended to show improvements in social behaviour compared to those who had no specific therapy. They seemed to pay more attention to their parents during free play time, which is important because limited attention to adults is a good early sign of emerging autism. They were also rated as somewhat more social during a play-based assessment with an unfamiliar adult. Scores on this measure have previously been linked with greater chance of autism. Infants who trialled the therapy showed improvements on a measure of attention control (or speed of processing visual information). To test this, images appear rapidly on a computer screen and researchers use eye-tracking technology to see how quickly infants can switch from looking at one image to another. Again, infants later diagnosed with autism have previously been shown to struggle with this task. This study is a pilot trial with a relatively small sample of participating families, but the researchers hope to show that changing early “risk” behaviours might prevent children from developing the full syndrome of autism symptoms and reduce their level of associated disability. The infants who took part in it are not yet old enough to confirm or rule out autism. And because the researchers selected and enrolled infants who had an older sibling with autism, most (around 80%) are unlikely to develop autism even without any therapy. Where is autism intervention science heading? These two recent studies and a handful of others present exciting work at the cutting edge of autism early-intervention science. Some might even call this prevention science. But, so far, this research is at proof-of-concept or pilot stage. There’s still a way to go. Nonetheless, these early results suggest that therapy in the first year of life might help children who are at risk of autism. Several types of therapy show potential for supporting infants to develop and practise early social skills – paying attention to and communicating with others – which present real challenges for children with autism. Follow-up work building on these early studies is underway. But what has already emerged from early-intervention science is that the disability associated with autism doesn’t need to be a lifelong burden. Therapy during the early years, and ongoing education and support throughout childhood and adulthood, can promote positive outcomes for people with autism spectrum disorders.